Smear the Brinjal with oil and roast it on a medium flame. Turn upside down when lower portion becomes soft. Keep on rotating until it gets roasted properly. Remove from the flame and submerge it in a bowl containing cold water. Heat oil in a frying pan or kadhai. Add onion and green chilli and fry on a medium flame till onions turn golden brown. Add turmeric powder, garam masala, red chilli powder and salt. Fry the masala for a minute and add the chopped tomatoes. Cook until tomatoes become soft. 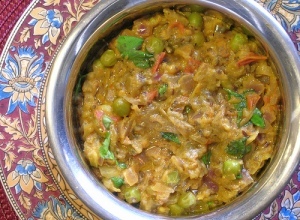 Now add peas and mashed brinjal. Stir properly and fry for about 5 to 7 minutes on medium heat. Serve it garnished with chopped coriander leaves.